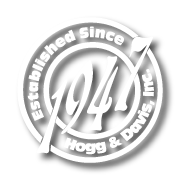 The Hogg & Davis Property Line Dolly introduces new versatility and efficiency to the transporting of materials to hard to reach property line jobs. Transformers, poles, power units, and wire reels can be handled with a minimum of work, and costly set-ups are eliminated for underground cable jobs requiring winch work in rear property line areas; as well as buildings or apartment house basements. Tapered roller bearings are used on the large rear wheels for efficient handling of heavy loads. The front pivot-axle assures smooth travel over the roughest terrain and the 4-ply 600×9 tires on rear wheels provide long service while assuring no damage to lawns when poles or materials are being hauled across them. 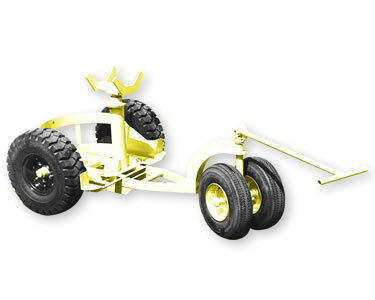 This Property Line Dolly was developed by men in the field, and has been proven by actual use, on the job, to be the lightest, most versatile and most efficient. Pound for pound, the Hogg and Davis Dolly gives you more “Carry-ability” in restricted space than any other dolly now available. For transporting poles into back yards, through narrow gates and across narrow sidewalks, or alley and other hard to reach areas, this dolly is specifically designed … the full 360 degree swivel of the Pole Post Cradle provides the necessary angle for clearance of most obstacles, and poles of almost any length can be moved in this manner. Rear Basket Assembly (any of three sizes), when used with handle, which is long enough to provide proper leverage for heavy loads, is sufficient to move large transformers; or, Full Dolly, can be blocked up after Pole Post has been removed and even large transformers can be transported into small rear areas, without the necessity of tearing out fences, etc … to get truck or trailer into yards. Three sizes of Basket Assemblies are available: 16”, 24”, and 31”, with overall Dolly width 14” wider than the basket … 30”, 38”, and 46”. This makes it possible to go through very narrow places and doorways. Wheels: Standard Industrial Tires and Bearings. Carrying Area: Model 31 – 31”x44 (787mm x 1117mm), Model 24 – 24”x43” carrying area. (609mm x 1092mm), Model 16 – 40” long (406mm x 1016mm) carrying area with 16” between wheels.